You are my Lord, my Savior and my Friend. You have blessed me so far above all I can ask or think in the past year. Each day was filled with examples of your grace and mercy, even though I didn’t deserve them. God, You are good and true no matter what the circumstances around me have been. I thank you, Lord, for my salvation and the opportunity to have a personal relationship with You. You have changed my life in so many ways because of this one miracle. Thank You for bringing me through my circumstances and carrying me when I was weak and weary. Thank You for defending me when I had no fight left in me. And thank You for showing me Your love and delight at every turn. You are my joy and my light. 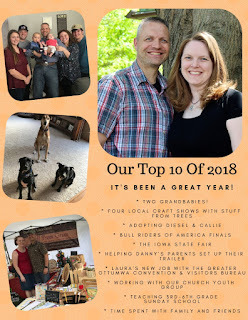 If your family is anything like ours, and I'm sure it is, you've had a busy and blessed year. God's been good in our lives, and we have so much grace and mercy to show for it. Here's how we've chosen to share a few snapshots of our life with our friends and family this holiday season. Instead of a long letter, we chose 10 memories that were unforgettable and spotlighted them. Add in our favorite photos and you can see it's been an amazing year. Want to make a Top 10 letter of your own? Use your word processing program or an online design program like Canva to create a one-of-a-kind layout. It's super easy, and you'll be able to send a holiday message everyone will enjoy reading. Would You Rather - Christmas Edition! Looking for a last-minute Christmas game to play with your youth or another church group? Try a round or two of Would You Rather ... Christmas Edition! Would you rather ... talk with Elisabeth about pregnancy at her old age or with Mary about pregnancy at her young age? Would you rather ... sing with the angels or listen with the shepherds? Would you rather ... stay in the inn on Christmas Eve or in the stable with the animals? Would you rather ... see the baby with the shepherds or see Him as a young child with the wise men? Would you rather ... go back to the sheep and praise God by yourself or race into town and tell everyone you can find about the baby? Would you rather ... follow the star or follow your GPS? Would you rather ... give gifts or receive gifts? Would you rather ... be the donkey that carried Mary to Bethlehem or be the donkey that carried Jesus to Jerusalem? When the angels arrived at the field, they already knew the song they were going to sing. Like a professional choir that rehearses for hours before the performance, the multitude of the heavenly hosts sang words they'd been practicing for ages past. What better song could the angels have sung on this special birthday? Who but the angels could have understood the mystery and power behind the tiny child they put to melody? The birth announcement for the Messiah was filled with glorifying God for this amazing blessing. He, at His highest, sent His Son to the lowest, down to us. And the shepherds He sent the angels to were considered low in their own rights. They would have been on the bottom rung of the ladder, so to speak. The highest came down. Glory to God! The lowest were the first to hear. Glory to God! The most powerful lowered Himself. Glory to God! The weakest were invited to meet the King. Glory to God! Most of us have three names. Some people might have four if there was someone special their parents wanted to honor. Others have a Junior or Senior behind their names, or a number to show the lineage of their name. There are also sweet and funny nicknames that stick with us for life. And many women change one of their names when they marry the love of their life. Names make us individuals, unique in a world of millions of people. We're not just another face in the crowd - we are special and loved. How much more wonderful then is the name of our Lord and Savior? Even before He walked on earth, His name was revered. The many names the people of Israel would know Him by were recorded throughout Scripture, and Isaiah tells of several of the most beautiful. 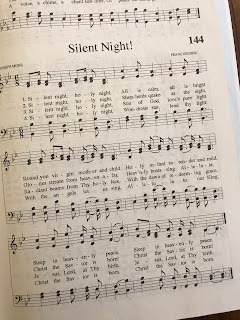 Hymns Of Christmas — Silent Night! When was the last time you had a truly silent night? Or afternoon? Or five minutes, for that matter? Silence is something we often take for granted. We fear it, or we try to fill it, or we keep moving so quickly that we don't even notice it's there int he background. But that first silent night, the one we sing about at Christmas every year, was perfect in its holiness. The calm came from the presence of the Lord with us. The brightness came from the Light who would walk among men. The heavenly peace that descended on the night of Christ's birth was heaven-sent. Even if we turn off the television, mute the radio and get everyone around us to stop talking, it won't be the same as the quiet in our hearts that comes from God alone. That's the peace they experienced that night in Bethlehem 2,000 years ago. One of the amazing things about living in Iowa is our beautiful feathered friends. All along the Des Moines River, you can find stopovers for eagles, pelicans and several other species of migrating birds. This weekend I took a drive down a road I've never featured down before. Just a few miles from our home is a spot where the trees open up to an amazing half-mile section of river. On the other bank were four gorgeous eagles. 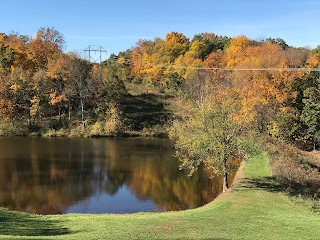 I pulled over, turned off the car and snapped a few photos. Then I just sat and watched them while they watched me. We'll see if they go tell their friends that they finally spotted a girl in a red car. If you're out and about in the days to come, stop and see what surprises you'll find. Take some pictures and take some time to slow down this holiday season. Everything new and modern isn't always for the best. If we look back at Christmases past, it wasn't about buying a bunch of stuff. It wasn't about having the perfect picture to post on social media. 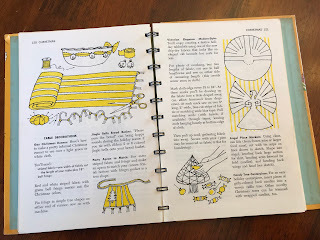 Look at these pages from a 1960 cookbook, and I'm sure you'll see what I mean. Decorations were made from supplies the family already had. 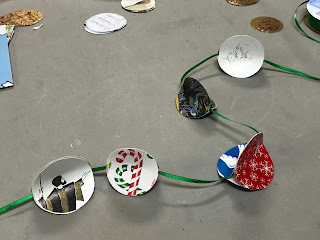 Ribbon, cloth, candy and a tin can lid or two were turned into some festive memories. Imagine trimming the tree with beautiful fresh fruit instead of mass-produced decor that everyone will have. A tree covered with artificial flowers was a special, one-of-a-kind centerpiece to the holiday season. We've gotten away from wrapped presents, turning instead to bags and gift card envelopes. Almost 60 years ago, creativity was key. Upcycling wasn't a catch-phrase: it was what you did to show how much you cared. Are You Taking Care Of Yourself This Christmas Season, Too? This time of year is notorious for its busyness. Combine the things we want to do with the things we need to do, and there's probably a full calendar in front of you. Instead of letting this season drain us, let's use the holidays as an opportunity to take care of ourselves in the same way we're apt to care for other people. How much spare time do you have today? It may be 10 minutes, or you might have a whole afternoon. Here are just a few suggestions for ways to practice a little self-care in our busiest days. * Make a cup of something warm to drink. * Cuddle and love on your pets. * Read a devotion and meditate on the Scripture references. * Pick out a book you've been dying to read and curl up somewhere quiet. * Look through your closet and put together a few fun holiday outfits for those upcoming events. * Bake your favorite cookies. * Go to the library and browse the stacks. If you had to make a random guess, how many cookies, cakes and candies do you think you eat during the Christmas season? Are you a grazer - do you just eat your way through the holidays? Do you just give up and eventually accept any and every yummy treat that comes your way? If this mentality sounds familiar, you can assume there are many other people who feel the same thing. This Christmas, let's take a stand and help each other find moderation with all the goodies. What can you do? It can be simple. * If you're making and giving lots of sweet treats, practice portion control. Small plastic containers, especially ones with compartments like the ones pictured here, are the perfect solution. * Instead of making full-sized loaves of bread or quick bread, make several mini loaves. More people can receive one, and you'll give smaller portions. * Choose small gift plates rather than dinner plates. You can fill them fuller and still give fewer treats. When you bring out your Christmas decorations or when you do a little winter organizing, you probably come across Christmas cards from days gone by. (Or years gone by, as the case may be.) Today's DIY will give you an idea for turning the images from those cards into an adorable garland. Start by punching out large circles from the fronts of the cards. I used a 1.5-inch circle punch. You can make the three circles all from the same card or mix and match them as you please. Keep punching until you have 10 or 12 sets of three pretty pictures. Use adhesive on two sides of one circle and attach the second circle on one side. Add the third circle, so now there is a little triangle with an open side. On this first day of Advent, we look toward celebrating the birth of our Lord Jesus Christ. This anticipation, a joyful and hopeful expectation, is heightened at this time of year. 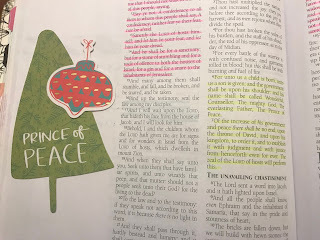 In the midst of the hustle and bustle of everything the world says Christmas should be, we can instead quiet our hearts and focus on how special this season is. When we look at the songs of the season, what better place to start than with a song of joy and anticipation. God's people have always been looking for the arrival of the Messiah, and O Come, O Come, Emmanuel speaks directly to Christ Himself, asking Him to come into both our world and our hearts. 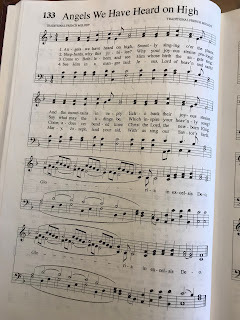 The story of this beloved Advent hymn dates back to the 1600s and 1700s in Germany and France. It soon became a treasured song in many languages and denominations. The words and translations have changed over the years, but the theme remains the same: We are waiting for You to come save Your people. The countdown to Christmas has already begun in many ways. Gifts are being purchased and wrapped, travel plans are being made and meals are being planned and prepped. The tree goes up, the lights go on and traditional decorations are added. Do you know why we celebrate Christmas with the symbols we do? To start your holiday season off right, here are just a few explanations of the decorations we use. Evergreen tree: eternal life for the believer. Lights: Jesus is the light of the world. Candy cane: to resemble the shepherd's staff. The title of an email I received last week caught my attention. 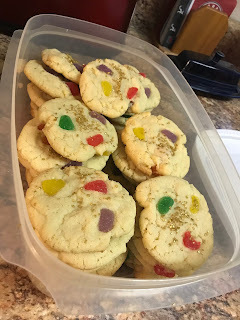 It was from Betty Crocker, and it was inviting me to take on the 24 Days of Cookies challenge. Each day they would send a different cookie recipe to bake and share with those you love. Cookies. Sharing. Loved Ones. Works for me! 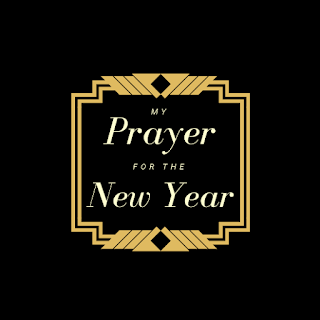 I encourage you to try something new this year. Go online and find a baking challenge. Pull out a vintage cookbook and revive some old recipes. 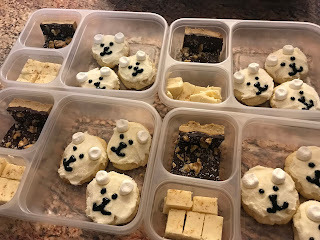 Make someone's favorite goodies and make that their Christmas present. Have fun with it, and it might become your new holiday tradition. We Love A Good Puppy Pajama Party! 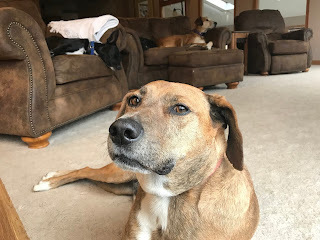 While friends of ours were out of town over Thanksgiving, we added their dog to our pack for a few days. Any fan of the Marvel Universe will know exactly where Stark got his name. He also had a couple of firsts while staying on the property. He saw deer and turkeys and, judging by the amount of time he spent looking out the window, he was fascinated. It's the little things that make me smile. We love it when Stark gets to play with us, and we hope he enjoyed his time here as much as we did. Next time, we'll share more treats and more belly rubs! 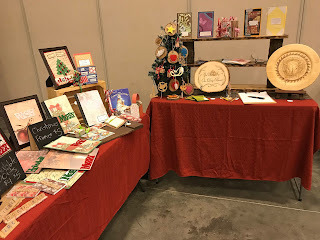 Here's a HUGE thank you to everyone who came to visit Stuff From Trees at The Craft Show Before Christmas. You were all such a blessing, and we're so glad we will be part of your holiday celebration this year. We also met many new friends, and we look forward to hearing from each one of you. Our business is about connecting the perfect gifts with special people, and it makes us smile when each piece finds a new home. This was our last show of the year, and that means we're back in full on Etsy. You can visit Stuff From Trees 24/7/365 and be prepared for an amazing Christmas season. We love custom orders, and every gift we offer can be personalized - as if being a handmade, one-of-a-kind business wasn't enough! Message us now to make sure your beautiful, unique gifts are shipped and delivered in time for Christmas. Thank you again for a wonderful show season. See you in the shop again soon! Did you get your fill of Thanksgiving dinner favorites yesterday? Is the refrigerator full of leftovers that you just couldn't eat one more bite of? Would you like to try something besides sandwiches and casseroles to use up that amazing food? Then have fun and make it into a pizza! 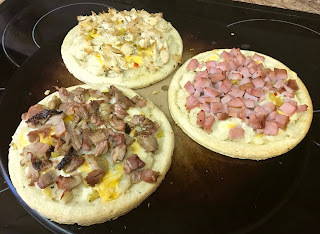 We used mini pizza crusts for ours, one each for dark turkey, white turkey and ham. You can use each and every kind of meat you had for Thanksgiving as a pizza topping. So now what do you use in addition to meat? Everything but the kitchen sink. For the pizzas pictured here, I started with a little bit of butter on the crust, then added a layer of warmed mashed potatoes. Heat them for a couple of minutes in the microwave and stir in a little milk if they're dry. Then I layered on chunks of cheese, banana peppers and meat. You can also use stuffing, gravy and a little cranberry sauce - we just didn't have any left! As Christians, we are the most blessed people in the world. Our thanks and praise to God should overflow our hearts this day and every day. From our home to yours, Happy Thanksgiving! Want to keep the kids busy for a little while while you're putting together Thanksgiving dinner? Pull out some magazines, newspapers and grocery store ads to spark some creativity. Special bonus: They will be off their electronic devices for a bit. Yay! 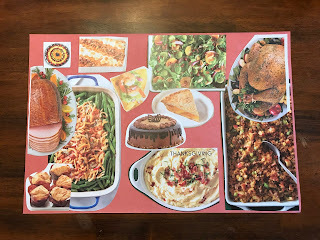 Most children don't get to plan the holiday meal, but by making their own dream menu, they can think about what kind of food they would like to have. You're lucky mine wasn't covered completely in chocolate. I was tempted, though. Now the fun begins. They can go through and cut out any pictures of anything they'd like to have on their special menu. Then they arrange them on the page and glue them down. If there's any space left over, they can write notes, give cooking instructions or just sign and date it. Who knows - you might be encouraging a future restauranteur. 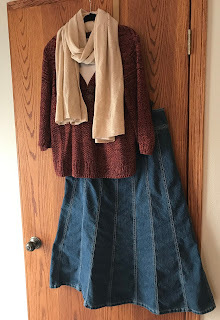 My original intent for a Thanksgiving outfit post was to head to the thrift store and put together something amazing. Then my heart got convicted and I headed to my own closet instead. What I found was a treasure trove of options I hadn't thought of before. Many of them, like this warm sweater, can be worn with skirts as pictured or with jeans and khakis. Denim doesn't have to be blue. Try your tops with black, red or other colors. Patterned skirts can be worn with a variety of tops - sweaters, houses or blazers, to name a few. Solid colors on top are dressed up with bold jewelry. Or do the opposite and put the pattern on the top. Keep the same jewelry and you'll have a whole new outfit. Khaki skirts or pants are the perfect match for a denim shirt or jacket. Dress it up with a fall-themed scarf tied in small knots.